Just a month after beginning her freshman year at Cornell University, Marlee Pincus began coughing non-stop. A flu had been going around the campus in Ithaca, New York, so Pincus, then 17, assumed she had picked it up as well. But the cough only worsened, and she developed a fever and chills. In October, she was taken to urgent care , who had her was rushed to the hospital after worrying test results, reported student-run newspaper The Cornell Daily Sun. 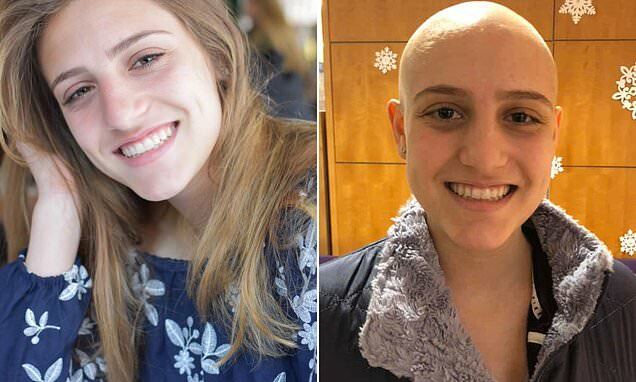 Pincus, now 18, was diagnosed the same day with leukemia, a blood cancer, and learned she was going to have to put on college on hold so she could enter intense chemotherapy treatment for the next two years. The teenager says the diagnosis has given her a 'new perspective on life' and she's even raised more than $20,000 for leukemia research. Pincus recalled how the first few weeks of her college experience were just as she imagined it would be. 'I was meeting so many interesting people, learning new things, eating unhealthy foods, and staying up very late...typical college stuff,' she wrote in a blog post for the Leukemia and Lymphoma Society. In September, Pincus and several of her friends fell ill, which attributed to a flu that was going around. But as her friends recovered, she got worse - but thought it was maybe just stress from her classes. Her white blood cell count was high and her levels of hemoglobin, a protein in red blood cells that carries oxygen throughout the body, were low, which was concerning. She was rushed to Hackensack Hospital in New Jersey and diagnosed with T-cell acute lymphoblastic leukemia.